Put yourself in another place and time. Our permanent exhibit tells the story of Titanic’s creation and demise, drawing out the key role Halifax played in the disaster. While Titanic’s survivors went to New York, all who perished came to Halifax. The cable ship crews braved awful conditions to recover bodies and invented a unique system to solve the mystery of many unidentified victims. Many kept pieces of Titanic wreckage in their family for generations, preserving wonderfully carved pieces of her woodwork found as flotsam after the ships’ sinking on April 15, 1912. Glimpses of their personal stories and those of the victims who are buried in Halifax are the essence of the museum’s Titanic connection. Visitors will be introduced to life aboard Titanic -- from the crew stoking the boilers to the immigrants in third class to the passengers travelling in first-class style. Sit in a reproduction of a rare Titanic deck chair and imagine what it would have been like to relax aboard deck of the most luxurious vessel in its time. In addition to a Titanic deck chair, there are over 50 objects including artifacts (collected as flotsam at the time of the great ship’s sinking) and historic photographs. 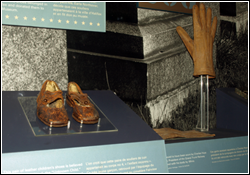 One of the most poignant objects that evoke the solemn and the personal devastation of the sinking are the shoes of Titanic's Unknown Child and a mortuary bag which was used to identify and safeguard the personal effects of Titanic victims. This pair of leather children's shoes is believed to be from Body No. 4, the "Unknown Child". This very young boy, recovered by the crew of Mackay-Bennett, was buried at Fairview Lawn Cemetery in Halifax. In 2007, as a result of extensive DNA testing, the child's shoes were identified as those of 19 month old Sidney Leslie Goodwin from England. The research was peer-reviewed and confirmed in April 2011. Mr. Goodwin was enroute to Niagara Falls for a job offer, the entire family, including Sidney were lost. Read the history behind the addition of the Shoes and Curatorial Insights from Dan Conlin, former Curator of Marine History (April, 2014). The mortuary bag on display was used to identify and safeguard the personal effects of Titanic victim Edmund Stone, Body No. 41. Stone was a 33 year old First Class bedroom Steward from Southampton. His body was found by the Halifax cable ship Mackay-Bennett and buried at sea. These bags were central to the system for Titanic body recovery and identification. They were hand stitched from sail canvas by Mackay-Bennett sailors as the bodies were found and proved very effective in keeping personal effects together on the ship and in the morgue. When the Halifax Explosion took place four years later in 1917, the coroner followed the Titanic example and made identical bags to handle the personal effects of Explosion victims. 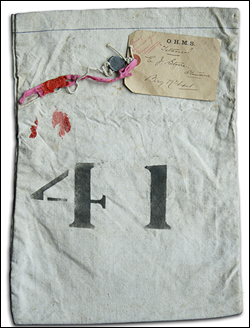 A photograph shows the personal effects of Titanic steward Edmond Stone which were shipped to his widow in Southampton using this bag. The letters “O.H.M.S.” on the tag stands for "On His Majesty's Service" indicating a government mail shipment. A lead and red wax seal was used to close the bag and protect its humble contents as they were all that was left of Edmund Stone after he died and his body was buried at sea. The personal effects were sold at auction in 2008. The cable ship crews followed a very old tradition called "wreckwood," keeping fragments of shipwrecks as reminders or commemorative objects. 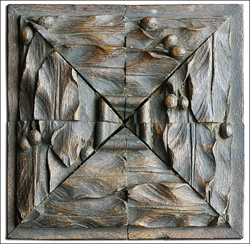 Often, unidentified pieces of wrecked woodwork were carved into picture frames, paperweight or crib boards. Some very large pieces of elaborately carved wood and a deck chair were also recovered and kept. These items were not sold commercially, but kept by the family of mariners who were involved in the recovery. Most items were donated, some loaned by descendants of Nova Scotians involved in recovering Titanic victims. See a wall-sized photo enlargement of Titanic's grand staircase surrounded by the beautiful carved balustrade and newel post, White Star Line's first class dinnerware; gloves from millionaire Charles Hays, then president of Grand Trunk Railway; the shore-based wire-less log with a moment by moment record of the ship's sinking; and a model of Titanic's rust-covered bow as it now appears, thousands of metres below the surface. The permenant collection on display also showcases a unique and intact piece of cabinetry known to have survived the sinking, a beautiful and rugged mahogany cabinet. This cabinet was recovered from the sea by the cable ship Minia and kept by Theodore Smith, one of the crew. His family made the cabinet their "medicine chest" for generations. The cabinet's markings show it was from the First Clas bathrooms on Titanic's B Deck, an indication of the decorative care dedicated to even the humble areas of First Class. A model of a White Star Line lifeboat, typical of the twenty lifeboats aboard Titanic,is also on display. British Board of Trade regulations required passenger vessels to carry lifeboats with oars, sails and supplies to sustain life for many days at sea. The regulations did not require that lifeboats be provided to save every person aboard. Lifeboats were expensive to maintain and took up precious deck space, so Titanic had lifeboats for less than half of her full compliment. Learn more about Nova Scotia's connection with Titanic.